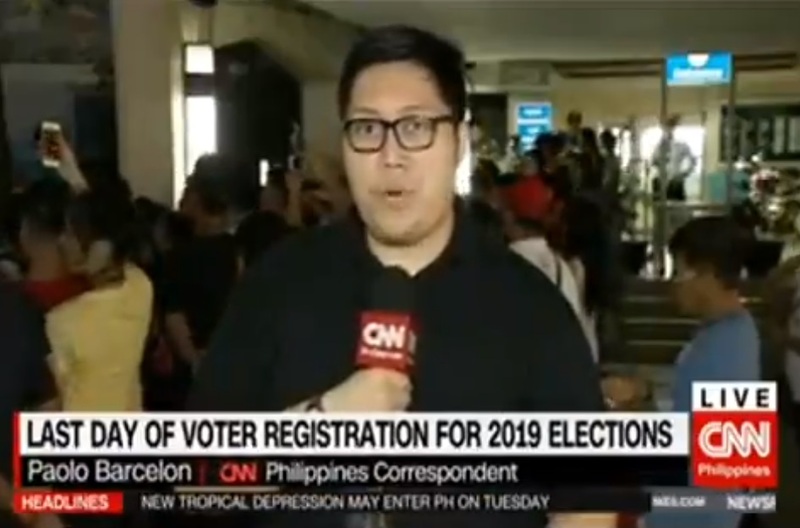 CNN Philippines has recruited former PTV4 reporter Paolo Barcelon. In a similar role at his new television home, Barcelon will be filing reports for the local CNN station's national news programs, covering a variety of news beats. Barcelon, now 23, first joined the industry via the state-run TV network in December of 2017. During his 8-month stint at PTV4, he has managed to cover major beats such as the House, Senate and Malacañang. Among the highlights of this time at the network was his reporting in Kuwait during the diplomatic crisis earlier this year. He was also the PTV4 reporter who broke the story about the shooting of Tanauan City Mayor Antonio Halili in July. Media Newser Philippines recently caught up with the young reporter to talk about his move to CNN Philippines. This interview has been edited for clarity and length. Media Newser Philippines: Why did you decide to move to CNN Philippines? Paolo Barcelon: I took a leap of faith and moved to CNN Philippines early in my career because of several reasons. Una, I wanted to grow more as a journalist and learn from the kind of storytelling that they do everyday. Pangalawa, I take it more as a personal and professional challenge. Having done so many coverages for PTV4 and going straight to a reportorial job is no mean feat. I have a lot more to learn and prove to myself and to the country I serve — hence I moved. MNP: What are you most looking forward to at CNN Philippines? PB: The chance to learn from and work with some of the best in the industry! People like Ms. Pia, Ms. Pinky, Ms. Ruth, and of course Ms. AJB (Armie Jarin-Bennett). They are all seasoned veterans in their own rights. I want to learn how to better deliver stories of Filipinos through their passion and expertise. It’s also an opportunity to learn from a lot of the experienced field reporters CNN Philippines has. Kuya Rex, ate AC, ate Joyce, ate Ina, kuya Gerg, kuya Anjo and sir David are people I look up to in their beats, and I hope to learn from their successes and experiences. MNP: What will you miss the most about working at PTV4? PB: It’s the way they enable people like me who thought na wala akong tsansa sa industriya to be able to live a dream. PTV4 will always be the birthplace of this childhood dream, one that I had ever since I was three years old. I miss some of the people, most especially my cameraman Rocky Kabigting and assistant cameraman Jun Doromal — those two were a very big part of who I am today. PTV4 as a whole will always have a special place in my heart.